Monash Conference Centre has a partnership with several quality Melbourne caterers, including the Australian Boutique Caterer of the year, 2012 Restaurant and Catering Awards for Excellence. Sharing the University's health, environmental and sustainability standards our caterers have a passion for imaginative menus and fresh food. 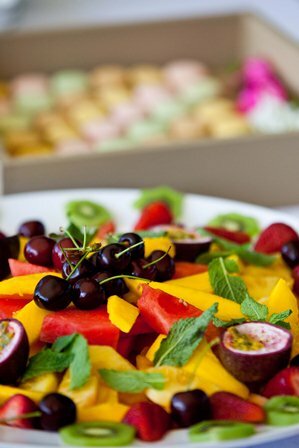 They value locally grown, seasonal and ethically sourced produce and can provide a variety of catering options for your event including vegetarian, gluten free, kosher and halal. Corporate boardroom lunches and dinners are also available with tailored menus matched with wines to suit your tastes, requirements and individual dietary needs. Authorised by: Chief Marketing Officer, Strategic Marketing and Communications. Maintained by: Venue Hire Webmaster Team. Last updated: Feb 2018.